Motorbase Performance today unveiled a stunning new livery design for Mat Jackson’s #7 Ford Focus ST at Silverstone ahead of the penultimate event of the Dunlop MSA British Touring Car Championship. Debuting a new partnership with Global printer manufacturer OKI for the final two meetings of the 2016 season at Silverstone and Brands Hatch, the eye-catching new design and sponsorship of the team forms the focal point of the company’s up-coming ‘Print My Ride’ competition. A first-ever for the BTCC grid; the striking custom-made wrap was printed on the new OKI ColorPainter wide-format printer and covers the entire Motorbase Focus ST. With its extensive range of printers – from office printers to wide-format and graphics devices, OKI currently serves many automotive organisations, delivering the speed and performance the industry demands – all while retaining a hyper-fast, high-resolution finish. “It’s fantastic to have OKI come on board with the team at this point in our campaign;” commented Motorbase Performance Team Principal David Bartrum. “To have that kind of radical change to Mat’s Ford Focus with such a vibrant and unique design for the last two crucial rounds of the 2016 season at Silverstone and Brands Hatch tops things off nicely. 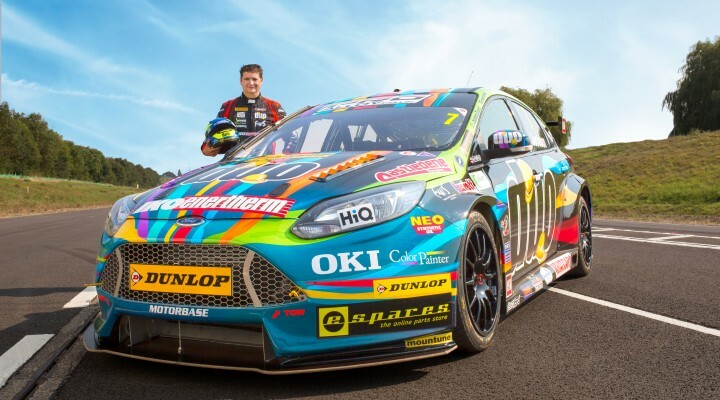 Following the BTCC season finale at Brands Hatch on October 1-2, Jackson’s Focus is set to get pulses racing at The Print Show (www.theprintshow.co.uk) on October 11 where it will be used as a launch-pad for OKI’s inaugural ‘Print My Ride’ competition. The printer manufacturer is offering budding artists and experienced creatives alike the opportunity to design a car wrap fit for the racetrack via a dedicated website: www.okiprintmyride.com. Entries from five categories will be judged by an expert panel with an additional ‘wild card’ class being awarded to the design that receives the most ‘votes’ on social media. The incredible prize package that awaits the winners includes VIP trips to the 2017 Dunlop MSA British Touring Car Championship, behind the scenes weekends with the Motorbase Performance team and signed team merchandise; along with a 1:18 scale-model Ford Focus ST wrapped in the winners own design. The overall winner will also walk away with a 50% discount voucher to spend on an OKI hardware product of their choice. OKI’s initiation into the BTCC comes as Motorbase Performance looks to capitalise on its 2016 success at the top of the Independent Teams and Drivers Championship and further close the gap to the overall leaders at Silverstone this coming weekend (September 17-18). Rounds 25, 26 and 27 will take place on Sunday with live coverage on ITV4, itv.com/btcc and the ITV Hub from 11:00 – 18:30. Saturday’s qualifying session will also be available online via live streaming at itv.com/btcc from 15:45 – 16:15.